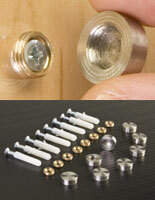 These screw covers offer an elegant yet simple way to improve the look of your signs. 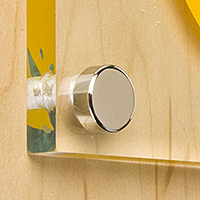 As an economical alternative to using standoffs, our metal caps hide straightforward fasteners for mounting a panel or plaque to any solid surface. The decorative screw covers thread onto special washers provided with purchase for creating a quick and easy presentation on any sign installation. Conversely, we also sell sandwich caps. These are designed to "sandwich" two or more panels together. Applications include closing the ends of two acrylic panels on a flag sign, or attaching a clear faceplate to free-standing displays. 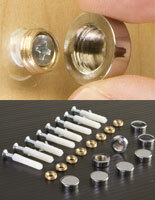 These screw covers are also available for purchase in bulk bags for large projects. Let us reiterate that all of our caps and covers are metal, not plastic. What are the basic differences between this screw cap hardware? Our screw covers come packaged in sets of eight units in four available finishes: chrome, polished gold, satin silver, and brushed stainless steel. Choose from two diameters, 5/8" or 3/4". 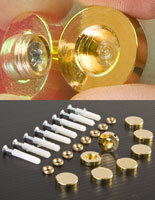 The kits come with (8) caps, threaded washers, screws, and hollow wall anchors. 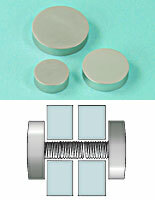 The sandwich caps feature 3/4" diameters and come in chrome and satin silver electroplated finishes. You also get eight caps with your order, however an assortment of (6) threaded studs are what makes these sets so valuable. 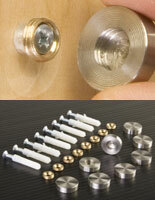 The different stud lengths make it possible to connect panels 1/8" thick on up to 1-1/2" thick. This allows great flexibility when designing signs and other displays. The covers that come with the sandwich cap sets are available for separate purchase. 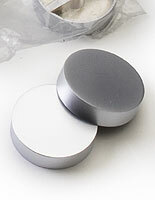 These come in bulk bags of 100 and 200 quantities in chrome and satin silver finish. What the bags do not come with are the threaded stud lengths. 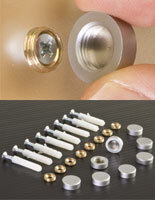 Keep in mind if you plan to use the caps with your own fasteners, 4mm thread size is required. This decorative hardware is marketed specifically to the design and architecture industry, where larger orders of wholesale sign making hardware are more likely to be needed. Designers could also use these supplies en masse depending upon the scale of the project they are working on. 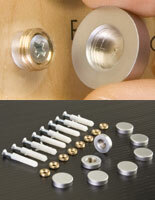 However, anyone can utilize these fixings for creating eye-catching displays. Store owners could use these to create wall-mounted poster displays promoting their prized products or a chic advertising strategy that distinguishes their store from others around them. Apply them inside corporate business lobbies as a part of the company's mission statement. 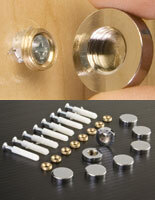 Our small decorative hardware will have a big impact on all your displays!